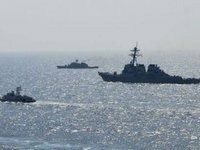 Ukraine's State Border Guard's naval forces in cooperation with Naval Forces of the Armed Forces of Ukraine and other units of the Joint Force Operation have conducted training exercises in the Sea of Azov. The aim of the exercises was to repel a mock enemy attack from the sea. According to the press service of Ukraine's State Border Service on Wednesday, the drills involved an intruder vessel, which ignored the requests and legal requirements of Coast Guard ship and Naval Forces ships and carried out dangerous maneuvers at high speed, trying to approach the shore for a possible landing. No landing of sabotage group was allowed. JFO Commander Serhiy Nayev noted a high level of training and coordination. "Such exercises allow us to hone our professional skills, additionally check the coherence of all interacting forces and be always ready to respond to developments in our area of responsibility," Donbas Coast Guard ship Captain Hlushak said following the drills.